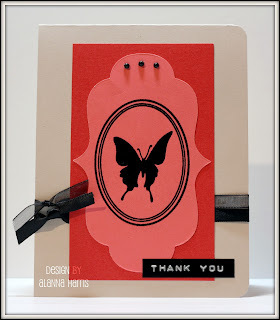 The butterfly and oval frame are heat embossed for a bit of dimension - I used detail embossing powder for the oval frame and regular embossing powder for the butterfly. The black elements help the eye travel around the card. I kind of like the pink label backed with the red panel - doesn't clash at all!! Hope you like it...make sure you check out the challenge and play along! Very pretty! I love your butterfly cameo framed in the oval. So brilliant! I would have never thought to use a butterfly as a cameo!